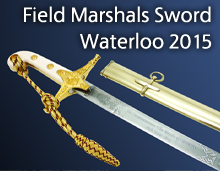 The Royal Marine Sword is based on the Infantry Sword pattern of 1897. 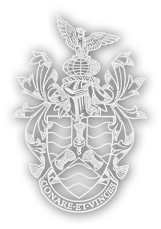 The straight carbon steel blade of this sword is two-edged for the final section of its length and finely etched with the crest of the Royal Marines. Blades are also available nickel-plated. 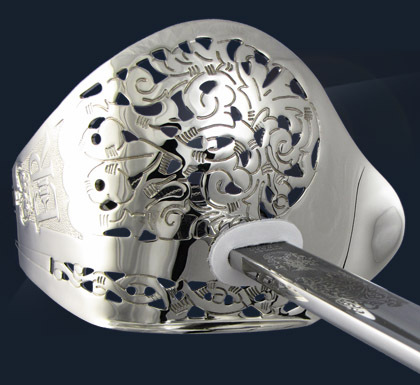 The guard is a three-quarter basket hilt it is pierced and etched with a scroll pattern that incorporates the royal cypher of the current sovereign and is nickel-plated. The grip is in black fish-skin normally shark skin bound with silver-plated copper wire. The Royal Marine’s Sword is carried in a Sam Browne leather scabbard with plated steel mouthpiece for service wear and for full dress occasions.